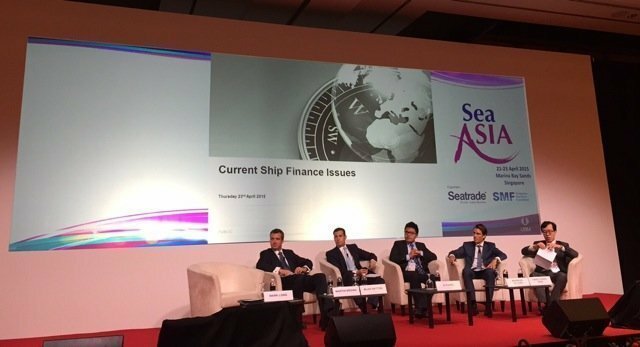 Singapore: The current climate for ship financing is warming up, and there is sufficient funds in the market, delegates were told at a ship finance discussion held at the Sea Asia conference. Mark Long, head of transport at HSBC, reckoned that reliance on bank finance is returning. “German banks are becoming less active and we have seen Asian banks aggressively increasing their share in the market, especially Chinese banks,” he said. Andreas Ostern, senior vice president of DNB Asia, said export credit agencies (ECA) now play an important role in the shipping and offshore industry, and a new group of investors have emerged as significant buyers of maritime listed equities. “In the past year, about 38% of the global shipping assets were acquired by new entrants in the market,” Ostern said. Ostern asked shipowners not to worry too much about financing. “Despite the market slowing down, there’s plenty of funds available,” he said. “Massive inflows of capital through bond and equity markets are slowing down, we expect consolidation going forward rather than continued high ECM activity,” Ostern added. Yang Changkun, managing director of ICBC Leasing, the financial leasing arm of China’s state-run bank ICBC, said there would be a capital boost in China’s shipping industry in the next decade, thanks to China’s recent maritime strategic plan, which is going to lead to a further transformation and expansion of the shipbuilding industry. However, Yang said Chinese banks are still playing a minor part in the shipping industry and they are still in the learning phase, mostly due to lack of understanding in shipping and risks, and lack of diversity in products. “A key provider of capital to the shipping markets is the banks and their presence is growing once more, and debt capital markets have been instrumental in filling the void vacated by banks,” said Alan Hatton, ceo of FSL Trust. He thought that equity capital markets can also provide some support if the timing is right.